I like this amplified cordless phone a little better than some others. Mainly because the functions are better laid out than some of the other models. And, although looks aren’t super important, I think it is a better-looking phone too. This model is designed for those with moderate hearing loss and low vision. 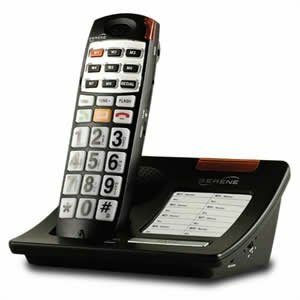 Here’s what you should know if you are considering buying this cordless phone for seniors. The bold black print on the large white buttons is very easy to see on this phone. I also think the layout of the buttons seems a little easier to understand. The key buttons are color-coded which should make them easier to use after some experience with the phone. The buttons are backlit too for use in the dark and have a talking function. The handset literally says out loud the number or function of the button as it is pressed. While on the subject of the buttons, though, there are several of them. This could get confusing for some seniors with more advanced memory problems. This one has the talking caller ID too that announces out loud the name of the incoming caller. Seniors will know who is calling and whether or not they should get up and answer because of this feature. The buttons also say the number and function out loud to help reduce errors while using the phone. This model boosts the volume of the incoming call up to 40 dB which is pretty significant and one of the highest amplifications available in this price range. It also uses a high definition sound system which enhances clarity of the call for better hearing and understanding. There is a loud, amplified speakerphone built into the handset. I laugh a little as I type this because my grandmother used her cordless phone speaker all the time. She could hear better with it and thought it was easy. There are 8 one-touch dialing buttons on the handset labeled M1 through M8. The buttons are small though as is expected. There is an area on the base where you can write who is assigned to the memory buttons for reference. There is also room on the handset itself but the writing would be small. The M1 button is red and I recommend setting it an emergency number like 911 or a trusted family member. The red stands out from the rest of the buttons. The CL-30 has a very loud ringer at 90 db. This is extremely loud – like the neighbors might hear it loud. It is adjustable up and down too. The ringer volume is also supplemented by a flashing light that also get senior’s attention when the phone rings. Pressing the page button on the base makes the handset ring. This is very helpful for finding lost handsets. You can add extra handsets up to a total of 4. This is great for having extra phones in bedrooms or bathrooms for safety and quick access. Anther safety feature for seniors is the battery backup. This allows the phone to be used even during power outages! There are a lot of great features on this phone to help those with low vision and moderate hearing loss. The bold, color-coded buttons are easy to see and use. The volume and ringers are loud. There are safety features too like the emergency button, page button, and battery backup that are important. I highly recommend this one.